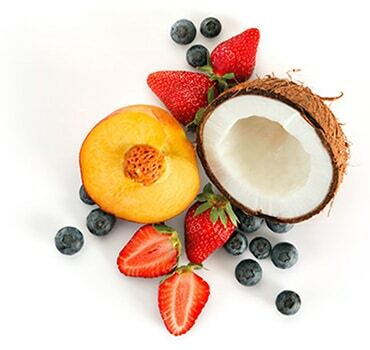 Perfect mix between real pieces of fruits and your favorite TOTAL 0% strained yogurt. Generously blended with real fruit and other favourite yoghurt pairings, FAGE Fruyo is the ideal snack: tasty and filling – thanks to its high protein content. FAGE Fruyo contains no preservatives or artificial colourings. It is extraordinary within its simplicity! 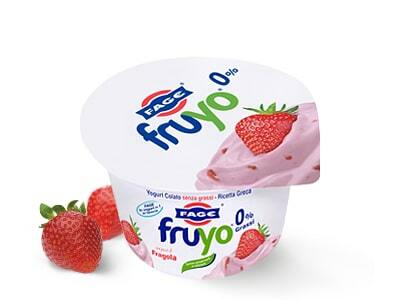 Try all FAGE Fruyo available flavours and discover the perfect one for you! Protein rich, Good source of calcium, Gluten-Free, Appropriate for Vegetarians. A generous blend of apricot pieces and our indulgently rich and creamy fat-free strained yoghurt. Strained yoghurt [pasteurised skimmed cow’s milk, live active yoghurt cultures (L. Bulgaricus, S. Thermophilus, L. Acidophilus, Bifidus, L. Casei)], sugar, apricot and apricot juice concentrate (8%), com starch, carrotjuice concentrate, natural flavour, lemonluice concentrate. A generous blend of pear pieces and our indulgently rich and creamy fat-free strained yoghurt. High in protein, Gluten Free, Appropriate for Vegetarians. A generous blend of real Mango pieces, and our indulgently rich and creamy fat-free strained yoghurt. Strained yoghurt [pasteurised skimmed cow’s milk, live active yoghurt cultures (L. Bulgaricus, S. Thennophilus, L. Acidophilus, Bifidus, L. Casei)], mango and mango puree concentrate 8%, sugar, corn starch, lemon juice concentrate), natural flavours. A generous blend of real Coffe and our indulgently rich and creamy fat-free strained yoghurt. Strained yoghurt [pasteurised skim.med cow’s milk, live active yoghurt cultures (L. Bulgaricus, S. Thermophilus, L. Acidophilus, Bifidus, L. Casei)], sugar, water, modified starch, coffee extract (0.5%), cocoa, pectin, thickener locust bean gum, flavour. A generous blend of real lemon pieces, and our indulgently rich and creamy fat-free strained yoghurt. Strained yoghurt [pasteurised skimmed cow’s milk, live active yoghurt cultures (L. Bulgaricus, S. Thennophilus, L. Acidophilus, Bifidus, L. Casei)], sugar, (lemon and lemon juice) (3.6%), tapioca starch, natural flavours. A generous blend of real Blueberries pieces, and our indulgently rich and creamy fat-free strained yoghurt. Strained yoghurt [pasteurized skimmed cow’s milk, live active yoghurt cultures (L. Bulgaricus, S. Thermophilus, L. Acidophilus, Bifidus, L. Casei)], blueberries (8%), sugar, corn starch, lemon juice concentrate, natural flavour. A generous blend of real pineapple pieces, and our indulgently rich and creamy fat-free strained yoghurt. Strained yoghurt [pasteurised skimmed cow’s milk, live active yoghurt cultures (L. Bulgaricus, S. Thermophilus, L. Acidophilus, Bifidus, L. Casei)], pineapple and pineapple juice from concentrate (8%), sugar, corn starch, natural flavour. A generous blend of real Vanilla, and our indulgently rich and creamy fat-free strained yoghurt. A generous blend of real cherries pieces, and our indulgently rich and creamy fat-free strained yoghurt. A generous blend of real strawberries pieces, and our indulgently rich and creamy fat-free strained yoghurt. Strained yoghurt [pasteurised skimmed cow’s milk, live active yoghurt cultures (L. Bulgaricus, S. Thermophilus, L. Acidophilus, Bifidus, L. Casei)], strawberry (9%), sugar, corn starch, sour cherry juice concentrate, natural flavors. A generous blend of real peach pieces, and our indulgently rich and creamy fat-free strained yoghurt. Strained yoghurt [pasteurised skimmed cow’s milk, live active yoghurt cultures (L. Bulgaricus, S. Thermophilus, L. Acidophilus, Bifidus, L. Casei)], peach (10%), sugar, corn starch, lemon juice concentrate, natural flavours. A generous blend of blueberries, strawberries and raspberries mixed with our indulgently rich and creamy fat-free strained yoghurt. Strained yoghurt [pasteurised skimmed cow’s milk, live active yoghurt cultures (L. Bulgaricus, S. Thermophilus, L. Acidophilus, Bifidus, L. Casei)], (blueberries, strawberries, raspberries) 8%, sugar, com starch, natural flavours. A generous blend of banana pieces and our indulgently rich and creamy fat-free strained yoghurt. Strained yoghurt [pasteurised skimmed cow’s milk, live active yoghurt cultures (L. Bulgaricus, S. Thermophilus, L. Acidophilus, Bifidus, L. Casei)], sugar, banana slices and banana juice concentrate (8%), corn starch, lemon juice concentrate, natural flavour, carrot juice concentrate. Copyright © 2018 NECTRA FOOD SA. All rights reserved.